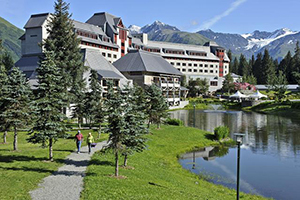 Welcome to The Hotel Alyeska, Alaska’s premier year-round resort destination. Nestled in a lush valley surrounded by mountain peaks, hanging glaciers and spectacular ocean views, The Hotel Alyeska offers our guests luxurious accommodations and convenient access to the magnificent Alaskan wilderness . We can’t wait to share with you everything that our amazing resort has to offer. Explore our Specials & Packages to find all kinds of specific offerings that suit your planning needs, or just check availability by your preferred dates. Experience what Alyeska Resort has to offer. It's all right here.